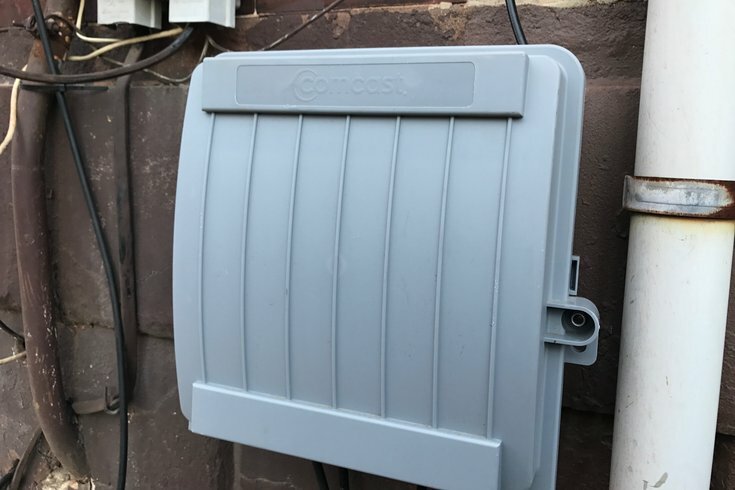 Comcast is installing boxes like this one, attached to a home in Francisville, on some Philadelphia houses as part of a street-by-street inspection the communications giant began in late 2015. But some residents in Fairmount and Francisville have voiced their displeasure with the boxes, which they view as an eyesore. For nearly two years, Comcast has been conducting a street-by-street inspection throughout Philadelphia to ensure its wiring is not violating any safety codes. The inspection, which is required by the franchise agreement Comcast signed with the city in December 2015, involves the replacement or relocation of various wires. Comcast is conducting inspections to remove unnecessary wires and install boxes to cover wires on some homes, an aesthetic improvement, the company says. But some residents in Francisville and Fairmount don't see the boxes in the same light. They consider the plastic boxes – 12 inches square and about 2.5 inches deep – an unsightly addition to the brick facades of many of the residential buildings in the adjacent neighborhoods. And they haven't always appreciated the way Comcast is carrying out its work – which requires them to opt out with a phone call if they don't want a box installed to their homes. Before conducting any work, Comcast places notices on the doorknobs of their homes to inform residents that its technicians will be installing boxes on their property. If the homeowner does not want the box, the notice provides a number to contact. When Ted Enger, a Fairmount resident, received a notice late last month, he called Comcast to say he did not want a box installed on his home. "They were really aggressive to me," Enger said. "They said it was only going to be the size of a matchbox, which is ridiculous. It's 12-by-12. It says it on the notice of what they're going to potentially install." Eventually, Enger said, he received verbal confirmation that Comcast would not conduct work on his home. But after seeing a lengthy thread on NextDoor, in which at least two neighbors alleged Comcast placed boxes on their homes without their consent, Enger called Comcast again. He wanted written confirmation that Comcast would not install a box – or anything else – on his property. "(Based on) some of the other people's experiences, I wanted to follow up with them and get some written confirmation that they weren't able to address the wires," Enger said. "I again reiterated that I gave them no permission to touch my house in any form at all." Enger did not receive written confirmation, but said Comcast has not done any work at his property to date. He shared his experience on the NextDoor thread, which had drawn concerns from more than two dozen residents and totaled more than 75 posts. Comcast left door hanger cards at customers' homes to give them the opportunity to opt out of the new wiring boxes. The thread, which remains active, mostly includes Fairmount and Francisville residents acknowledging that they told Comcast not to install anything on their property – some before they even received a notice. Others expressed fear that the boxes will diminish their property values. And in at least two cases, residents alleged the Philadelphia-based cable giant placed boxes on their property without consent. Angela Pack, of Francisville, claimed Comcast technicians attempted to install a box on her property even though she is no longer a Comcast subscriber. When she confronted a technician who had begun drilling a box into her front facade, Pack said the man ignored her – until she called the police. In the meantime, Pack said, another Comcast technician rolled up and intervened. But one day later, she again had to shoo Comcast technicians from her property. "It's funny to me that Comcast spends so much money trying to get customers back and then they turn around and do something like this," Pack said. "You could give me free Comcast service and I wouldn't go back to them." As part of its franchise agreement with the city, Comcast must complete inspections to "identify and repair any violations of the National Electric Safety Code and the National Electric Code," city spokesman Mike Dunn said. The company also is addressing aesthetic issues, including abandoned or loose wiring. The franchise agreement provides Comcast access to the public rights of way to operate and deliver services for 15 years. As part of that deal, Comcast must provide the city with 5 percent of its gross revenues from Philadelphia cable service, a total that exceeds $17 million each year. The inspection process, ongoing since late 2015, is nearly complete, said Comcast Vice President of Communications Jennifer Bilotta. Most homes are not slated to receive a box, she said. Rather, the company only seeks to install boxes on houses where three or more cable lines enter the home. The boxes keep wires better organized and protects them from the elements, ensuring quality service, Bilotta said. And Comcast believes they look better than a group of exposed wires, noting other service providers have placed similar boxes on Philadelphia homes. She acknowledged Comcast has received some complaints throughout its inspection process, but stressed that most reactions have been positive – particularly as unused wires have been removed. If residents do not want Comcast to install boxes on their property, Bilotta encouraged them to call the number listed on their notice or dial 1-800-COMCAST.